Still pristine: Many visitors to Hoi An City cannot resist the unspoilt beauty of Cham Island, which they can reach in just 25 minutes. Tourism has been a boon for residents of islands off the coast of Hoi An, but it is the authorities decision to limit the number of visitors that will help sustain these benefits. Cong Thanh reports. Born and raised on the Cham Islands, Tran Quy Tay has seen the area undergo a complete facelift in the last almost half a century. 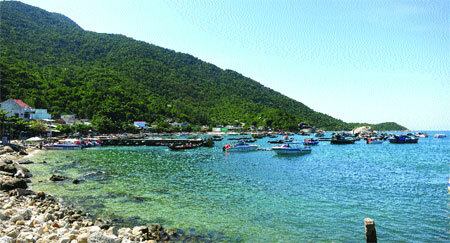 The quiet, green islands, 20km off the coast of Hoi An, are a favourite rendezvous for travellers and nature lovers. Thousands of tourists visit the islands each day. About 2,400 people live in the four villages on the islands, 80 per cent of whom immigrated there. In total they earn VND75 billion (US$3.6 million), 65 per cent of which is from tourism and service. Most islanders have stopped fishing and turned to the eco-tourism sector, which has doubled its income since the area was recognised as a World Biosphere Reserve in 2009. 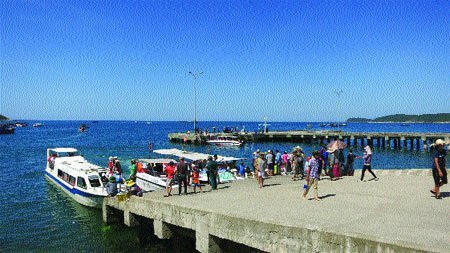 Of the four villages, Bai Huong, Bai Lang, Bai Ong and Cam, the beaches of Bai Ong attract 70 per cent of the total visitors. He said local residents earned about VND27 million (US$1,300) per month, double what they earned in 2009. “We encourage investment in tourism, while boosting environment, biodiversity and native culture,” he said. Tourism has seen rapid development over the past year, with a fleet of 125 speedboats carrying passengers from Hoi An to the islands and back every day. “It would result in overloaded accommodations and service and over exploitation of seafood and other marine resources, or destruction of the ecological system,” he added. 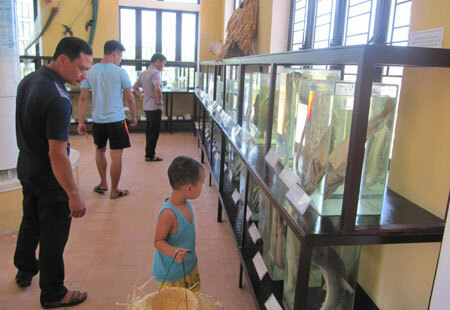 Getting to know the locals: Visitors look at samples of marine life at the Marine Protection Centre on Cham Island. The number of tourists can exceed the number of villagers on the islands at times, so the Hoi An People’s Committee set a daily tourist limit of 3,000. “It’s a bit of a shame for us, as we get less money from our speedboat services, but it’s the right decision and we (travel agencies and speedboat services) support it,” said Phan Van Tin of Dao Xanh (Green Island) Travel Agency. Islanders and tourists are told not to use plastic bags, to protect the coral reefs and fish. It is the first place in Viet Nam to ban plastic bags. Truong Thanh Phuong, a local fisherman, said he quit fishing and started working in tourism. The 40-year-old said his family could earn VND300,000 ($14) per visitor by opening a restaurant and homestay service, or provide fishing tourism. Efforts to protect the marine environment by local residents and the Maritime Protection Centre over the past decade have paid off. Le Vinh Thuan, an official from the Management Board of the Cham Islands, said a small colony of young coral had been growing back off the islands’ coast in recent years. Sunny days: Cham Island is a perfect getaway, where visitors can relax and do nothing, or have fun swimming in the sea. “It’s a sign of a well-protected environment,” Thuan said. “The environment around the port, which was seen as a heavily polluted area, has improved due to the 3-R (reduce, reuse and recycle) programmes that have been in operation since 2011. He said experts from the islands’ Maritime Protection Centre also collect crown-of-thorns starfish (acanthaster planci) – a shellfish that eats and destroys coral reefs. Chu Manh Trinh, an expert from the centre, said islanders have gradually recognised the importance of protecting coral reefs in the area. “Local people have nearly stopped dumping garbage and plastic bags,” Trinh said. “They are working on creating a clean and safe environment for coral reef to grow again. Now they join us in protecting the environment. “We provide between five and seven educational training courses on fauna and flora conservation for the locals, and the benefits from marine and environmental protection,” Trinh said. The seas around the Cham Islands is home to 1.26sq.km of coral reef. It also houses sea snail species, coral reefs, land crabs, lobster, and seaweed. A community-based group of 30 households were formed to get the exploitation of crabs under control. Land crabs have been conserved and protected by the residents and the centre for the past 10 years. “Only grown crabs (about 14 years or older) caught by the group under the centre’s supervision can be sold in the market,” said Cham Islands chairman An. Nguyen Van Nga, a resident in Bai Ong Village, said the crab would have gone extinct on the islands if the centre had not taken such strong steps to protect it. “The crab has been a source of income for local people in the offseason. We only caught 7,000 crabs, a fourth of the total on the island. We could sell crabs for VND1.2 million ($57) per kilo at the market,” Nga said, adding that the crab population has grown in recent years. “Tourists can easily find homestay services on the islands,” Tay said. “Sixty households offer accomodation, with prices of between VND100,000 and 200,000 per night per person, and VND100,000 per meal. 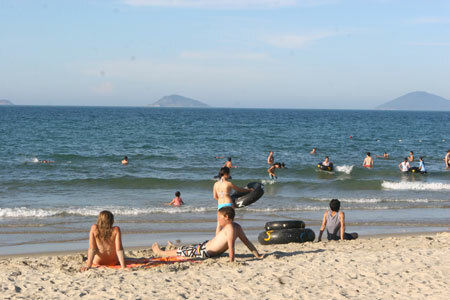 People just going for the day can get to the islands from Hoi An’s Cua Dai Beach for VND30,000. They can take their bicycles on board to explore the islands, as well. It takes 25 minutes to travel to the islands by speedboat. Various tourism services are also offered off the islands’ coasts, including scuba diving, snorkeling, sunbathing, trekking and bird watching at Hon Lao (Lao Islet). Tourists can rent motorbikes and bicycles to travel around the islands during the day, before enjoying night fishing with fishermen off the coast. Despite their success in tourism, the islands have had trouble with power, education, fresh water and sanitation. A diesel-generated power source provides electricity for nine hours a day, with subsidised prices for the locals. It still limits tourism, seafood storage and living conditions, said chairman An. WiFi is available, but the lack of power at night is still a problem for homestays. So most foreign tourists prefer day trips over staying overnight. Green technology applications such as wind and solar power, sea water filters or recycled waste water have failed because of a lack of funds. Sanitation has yet to be improved, though, he said. Flies swarm the islands in the summer as organic waste from restaurants piles up. Pham Vu Dung, director of Rose Travel, said the islands should find safer ways to clean the environment. “Safe chemical agents should be used to clean the islands several times per month,” Dung suggested. Every Saturday, art performances, good food and shopping markets open to lure in more overnight visitors. This entry was posted in Resource Management. Bookmark the permalink.